In an initiative to protect the caller’s identity, the Department of Telecommunications (DoT) has been asked by an Intelligence Agency to block the use of WePhone app. It has been noticed that this app allows a caller to conceal his or her identity which is unethical. WePhone app works on a very simple mechanism. It transfers a call using a router to the server which is located abroad, that depicts the original location of the caller. People who receives the call doesn’t get a clear idea of exact incoming number and location. This app tries to spoof the CLI mechanism through VOIP which is illegal in the eyes of DoT and that is why a Technical Committee has been formed regarding such activities. Caller ID spoofing can be used to create some prank calls or can be used to make anonymous threat calls that can be harmful for any nation. Caller ID Spoofing is a service that helps to masquerade the original number and the recipient sees a different number in his display. It has a similarity with e-mail spoofing where sender can use any address to send a mail. Same here in case of Caller ID spoofing, one can choose any number that will be displayed in the recipient’s phone. The process is also very simple, where the customer opens a web form and enter the actual phone number, the phone number of the recipient and a chosen number that will appear in the recipient’s caller display. The technical committee made in respect to CLI spoofing has found that some computer or mobile applications are providing such service. MR. Prasad further added that, on the basis of the suggestions given by the committee, the entire subject has been taken up with the Group Coordinator, Department of Electronics & Information Technology who actually issued the order of banning such identified websites who are involved in spoofing. This is also probably for the first time that any such requests have been made to DoT for banning a mobile app for call spoofing. Can WePhone app be effectively banned? The question is how can DoT ensure the ban? Because, even if the app url is banned, users can still download it from Play Store, and even if they manage to somehow block it on play store as well, users can just directly download the app from WePhone website and start using it. 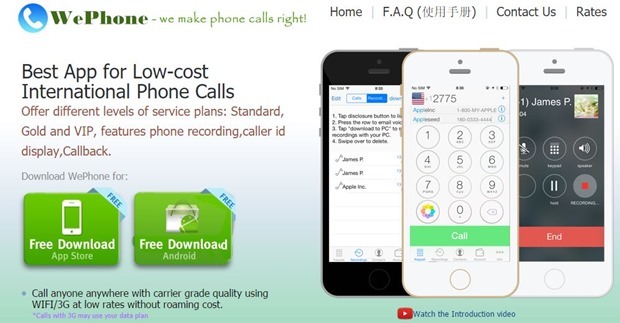 And if a wephone app user uses this app to make calls through internet , there is no way DoT can differentiate from ordinary internet traffic. "DoT Asked To Ban WePhone App Due To Call Spoofing", 5 out of 5 based on 1 ratings. 6 Things Every Programmer Should Know About A Marketer! I am one of the victims for these apps (spoofcalls, spooftexts, wephones. These apps have been destroying my life and identity. People using this app were abe to take control over my number. Somehow got into my vms . And was able to contact companies and credit card lines to get my pin. (Sometimes they are ask if they can send verification codes and pins to your phone) they need to banned these apps. Before they do illegal things ..
Banning the app within India, even if it is feasible, does not eliminate spoofing problem b/c outsiders can still continue to spoof. But a valid approach may be to strip them of access to PSTN gateway. I mean to penalize any interconnect carrier if they carry spoofed calls. The authorities can do spot check on potential offenders.